Graded MINT 9 by PSA. Rookie Card. This is one of seventeen examples at its tier (with eight graded higher) among a total of 35 copies recorded in PSA's census reporting. 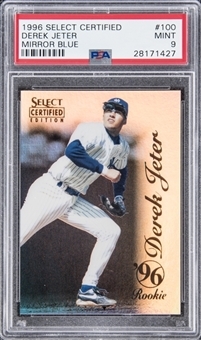 The offered Derek Jeter collectible hails from one of the most desirable parallel card sets ever made. The elite Mirror Blue version presented here – from a print run reported to number only 45 copies – delivers incomparable visual appeal and carries undeniable exclusivity. A truly amazing Jeter card, in Mint condition.